Keith Clark would have turned 90 on November 21st. Here is some information on the bugler who sounded Taps at the funeral of President John F. Kennedy. 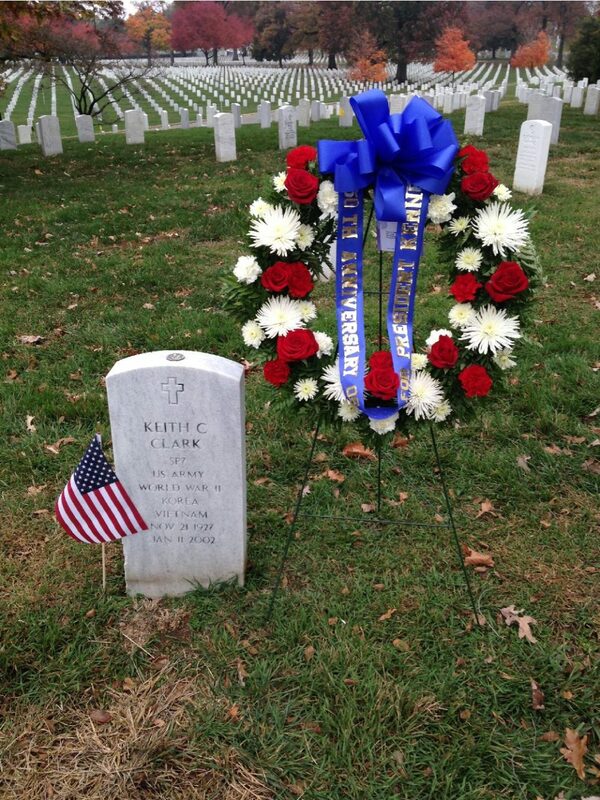 Keith Clark was the Principal Bugler with The United States Army Band who was placed in the world spotlight when he was called to sound Taps at the Funeral of John F. Kennedy. Life has a way of thrusting a person into the limelight when least expected. The sounding of Taps at the funeral of President John F. Kennedy was the first time the call was heard on such a world-wide stage. Millions watched or listened as those twenty-four notes were performed on that chilly day in November 1963. The performance has been the subject of newspaper and magazine articles, discussions, commentary, radio and TV reports and even an audio spectrum analysis. What happened during those 60 seconds is forever etched in the memory of Americans and touched the hearts and souls of people around the world who were mourning the death of the young president. 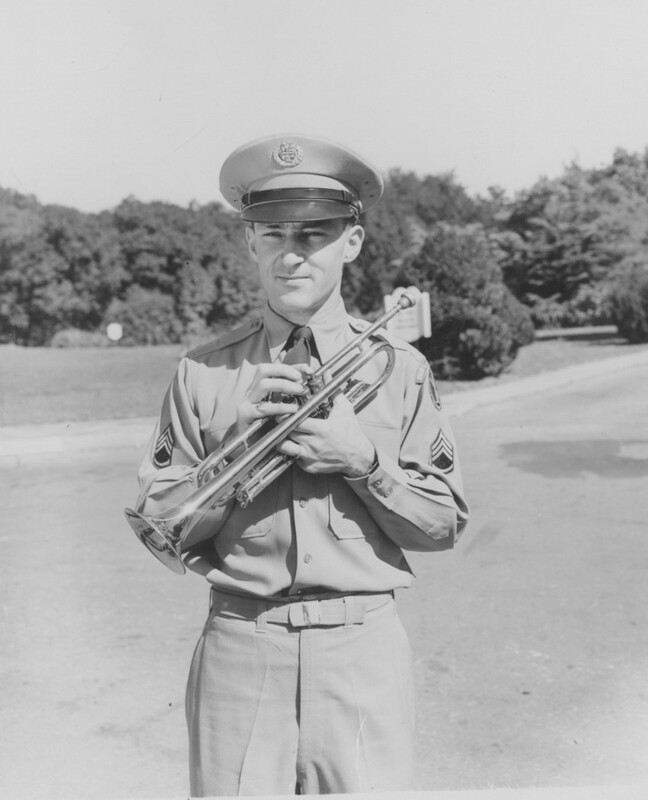 The musician behind the bugle that day was Keith Clark, the Principle Bugler with the US Army Band “Pershing’s Own.” Today we celebrate his birth and remember him, not only for that rendition of Taps for the President but also as a first rate trumpeter, musician, scholar, devoted family man and one of deep firm religious convictions. Keith Collar Clark was born on November 21, 1927 in Grand Rapids, Michigan. 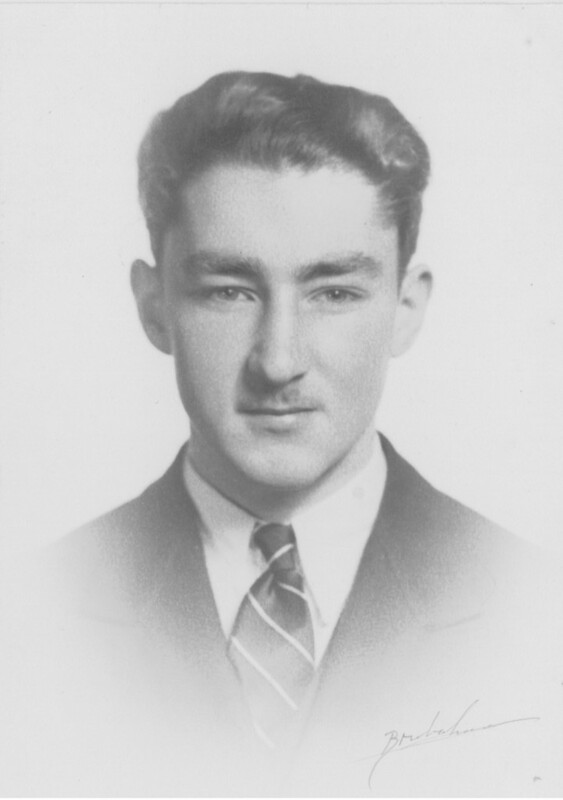 His father, Harry Holt Clark, was a professional musician who played flute and violin in several orchestras. When Clark was three, his father placed a toy trumpet on the fireplace mantel hoping to spark his son’s interest in music. Clark asked everyday if he could play with the trumpet. The answer was always the same: no, not until he would make a promise to take it seriously. It did not take long for Clark to make the promise to practice an hour everyday and his father replaced the toy with a real instrument. 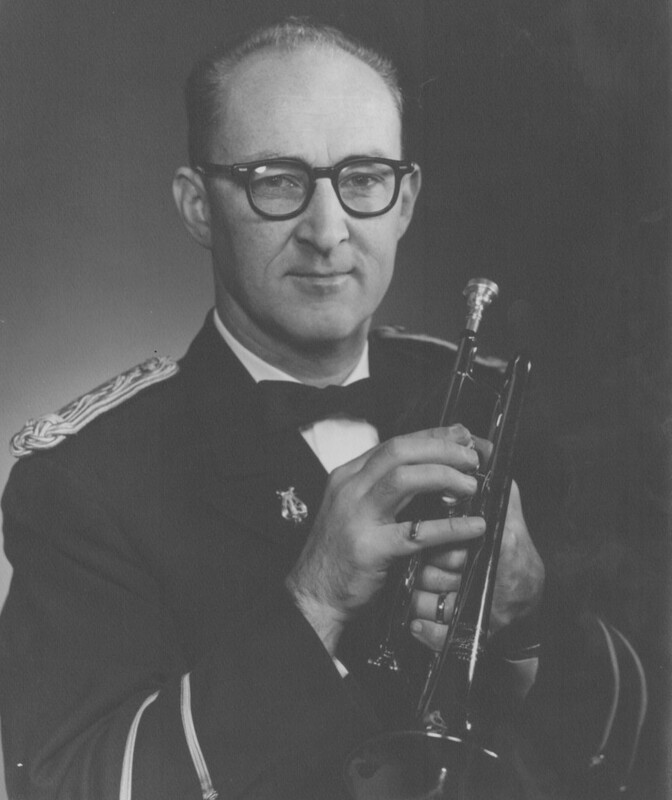 It was during his tenure with the Army Band that Clark received national attention as the bugler who sounded Taps for John F. Kennedy’s funeral. The Taps will be forever remembered as the “Broken Taps.” His bugle is on display at Arlington National Cemetery. 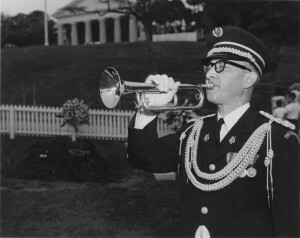 Clark performed at hundreds of funerals in Arlington and had played for President Kennedy many times, including sounding Taps at The Tomb of the Unknowns less than two weeks prior to his death during Veterans Day ceremonies. He also performed for President Eisenhower and recalled that Vice President Nixon once winked at him during a ceremony. After retiring from the army, Clark went on to a successful career of teaching, performing, and writing. His love of hymns brought him much recognition as a scholar and he has received numerous awards. 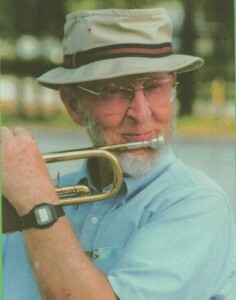 He lived in Florida and was quite active as a trumpeter. 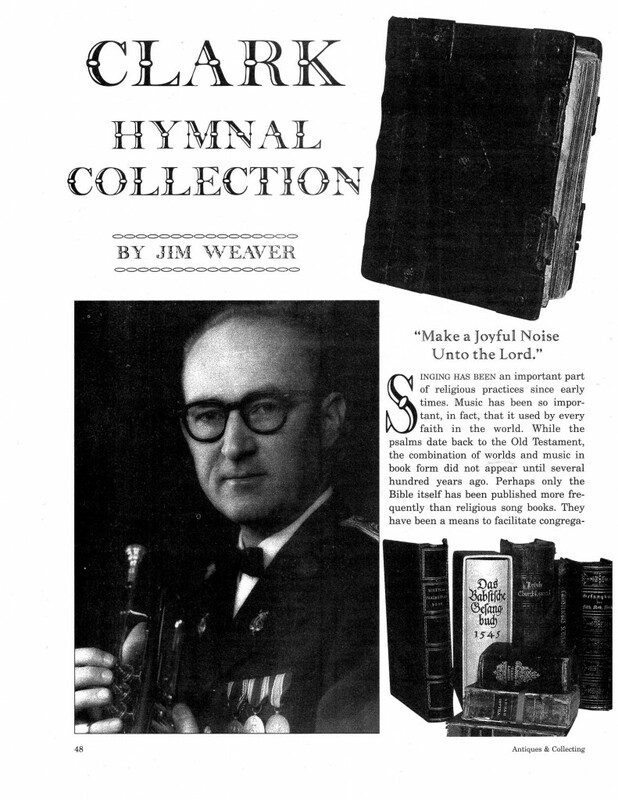 His collection of hymnals was acquired by Regent University, Virginia Beach, VA in 1982. 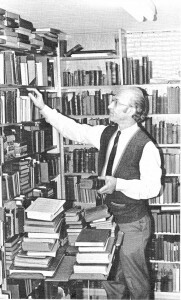 Mr. Clark’s great love for hymnody and Psalmody resulted in this large collection from various dealers and individuals. Containing more than 9,000 volumes, the Clark Hymnology Collection includes thousands of hymnbooks from various American denominations and churches, as well as several well-known books on hymnody from the 17th century to the present. 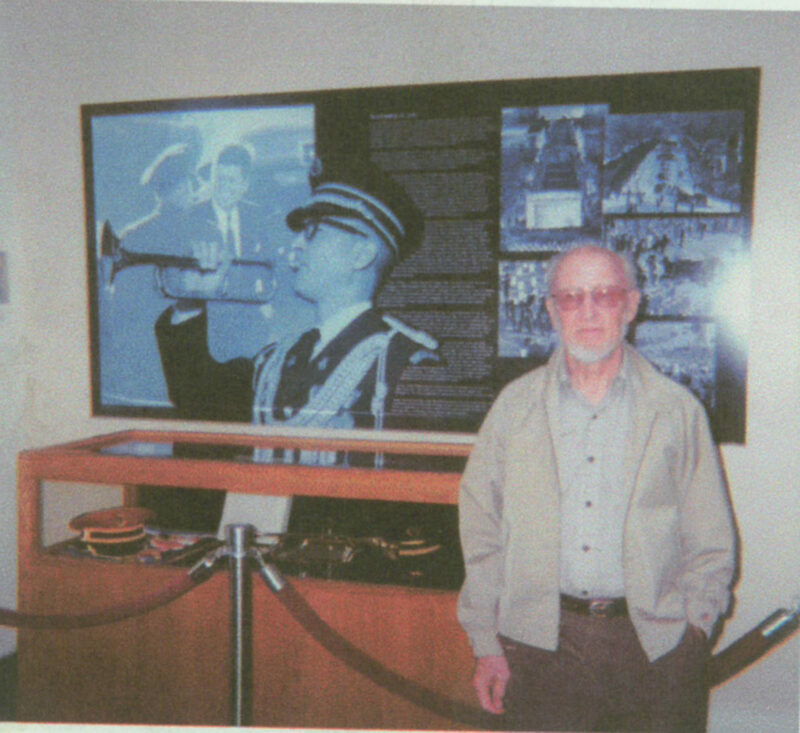 He was not able to attend the opening of the Taps Exhibit at Arlington but I was pleased and honored when I received a photograph of him standing by his bugle. 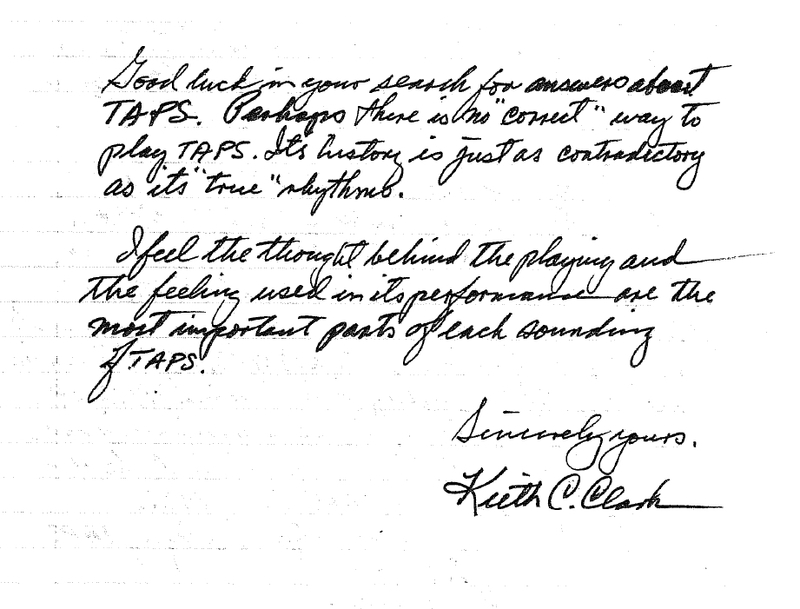 Keith Clark passed away on January 10, 2002 at the age of 74 and is buried in Arlington National Cemetery the graves of fellow musicians. 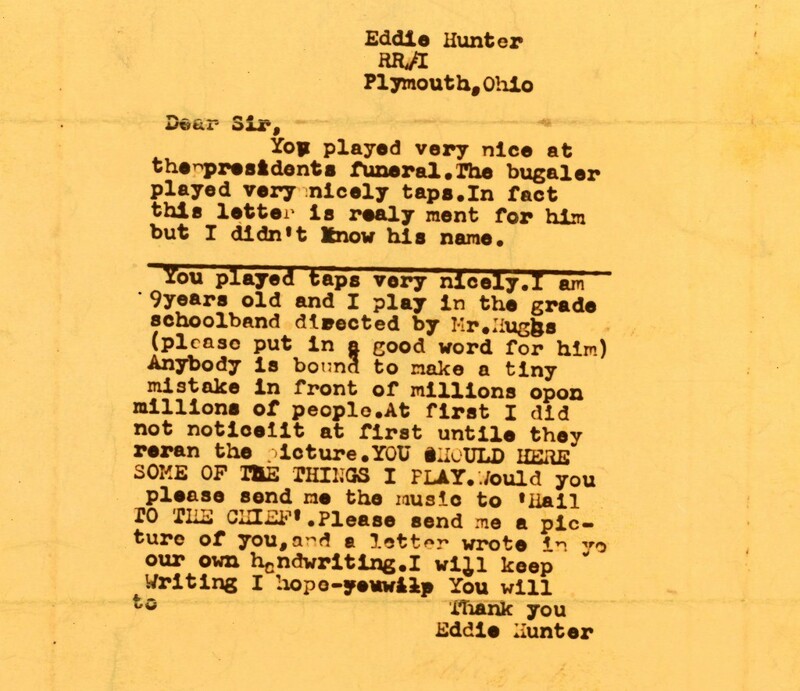 This entry was posted on Monday, November 20th, 2017 at 8:00 am	and is filed under Bugle Stories, Buglers Through History, History of Taps, History of the Bugle, News, Taps in Recent History. You can follow any responses to this entry through the RSS 2.0 feed. You can leave a response, or trackback from your own site. Coincidentally, tomorrow will be the 49th anniversary of JFK’s death. To my thinking, this adds a poignant element never mentioned in Clark’s narrative of the events. The assassination occurred the day after Mr. Clark’s 35th birthday. Thank-you. He was great American. I hope we have done him justice. I am working up to do a full story on him next year for the 50th anniversary. As one of Keith Clark’s daughters, I just want to thank you for all the time, effort and pictures that you’ve posted on the Internet. He has a growing family of grand and great-grand kids who are unfamiliar with his story, but I’ll be spreading the word on all the wonderful additions! Thank you, and God bless you! I was told by my stepmother that the man who had been the bugler at Kennedy’s funeral was by my father’s side in 1971 when Dad died of a heart attack. Mr. Clark had been helping my father cut down a diseased tree which was in danger of falling on Dad’s house. It was hot and muggy late summer weather in Virginia. My father suffered a heart attack and died almost immediately. Mr. Clark was the last person he saw before he died. It still touches my heart. May they both rest in peace. For almost 100 years, at The Hockaday School, a private girls’ school in Dallas, “Taps” is played at our commencement. Our sixth-grade students take an annual trip to Arlington National Cemetery and lay a wreath at the Tomb of the Unknown Soldiers and listen to “Taps.” My husband Jon Christian Merkel was a pilot for Air America killed flying in Laos 18 Feb 70 and “Taps” was played at his funeral in Louden Park in Baltimore. My brother Frederic Baldwin Boruff was buried in Wichita Falls, Texas, in 2010. I salute the men and women who play “Taps” for our fallen heroes.